Gift-giving season is on its way. If you’re trying to come up with gift ideas for your loved ones’ stockings, you’re in luck. This gift guide is full of nifty gadgets, gizmos, and thing-a-ma-bobs that will make anybody’s bathroom instantly more fun, and daily routines easier to do. Purchase links are included for each bathroom gadget. Happy holiday shopping! Know a guy with a hairy back? Or, maybe you have an athlete in the family. Either way, the first gadget on our list is sure to please. The Bakblade is a back and body groomer designed with an ergonomic handle (read: you’ll be able to shave that hard-to-reach spot without pulling a muscle). Plus, you can use it wet or dry – both will result in a smooth shave. Finally, it comes with extra-wide blades, so you’ll get done shaving faster. This grooming tool is highly-rated on Amazon for a reason. Any guy in your life will love it. For the little ones, the Aqueduck Faucet Extender is a great solution for reaching bathroom sinks. The simple design effortlessly attaches to your bathroom faucet and extends the stream of water, so any person can reach it. Plus, it’s super affordable. Win-win! Foggy bathroom mirrors, no more. 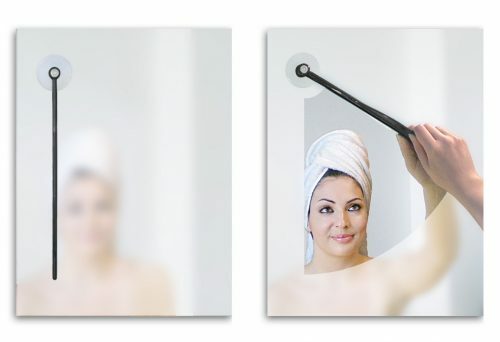 This next bathroom gadget is a lifesaver when you just want to be able to see your reflection after you shower. The Mirror Clearer works much like a windshield wiper. It attaches to your mirror with a suction cup. When the mirror is foggy, just rotate the wiper over the glass. You won’t have to use your hand (or smudge up your mirror) ever again. 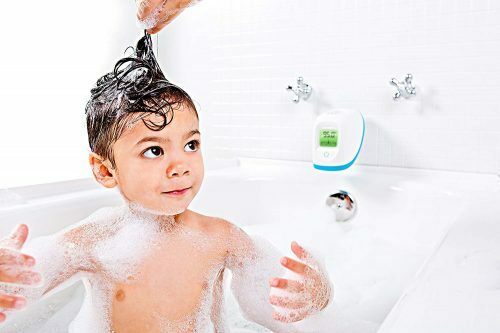 Getting bath water just the right temperature is important for bathing babies, the elderly, and the ill. With the Thermometer Spout Cover, you’ll know exactly what temperature your water is – no more too-hot or too-cold baths ever again. Best of all, this bathroom gadget easily snaps over your tub spout, is made with foam, and gives an accurate temperature readout. Trying to get every last bit of product out of a toothpaste tube is annoying. With the Toothpaste Tube Roller, you don’t have to deal with that. 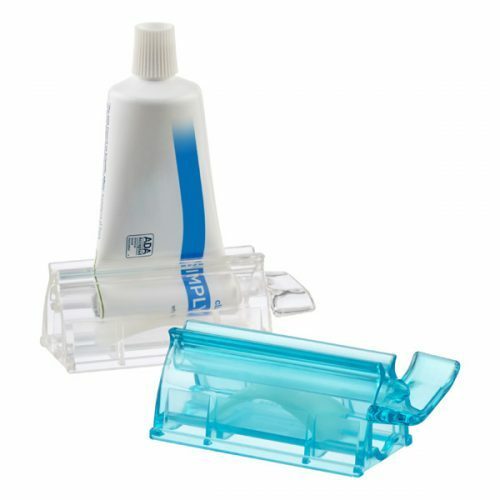 Simply insert the bottom of your toothpaste tube into the gadget (or any other bathroom product that comes in tube form – think lotions, makeup, and more). Secure with the provided key, then turn the key to dispense your product. Best of all, the Roller props your toothpaste upright to save counter space. Taking a long, luxurious bath is great – until you drop your phone in the water. 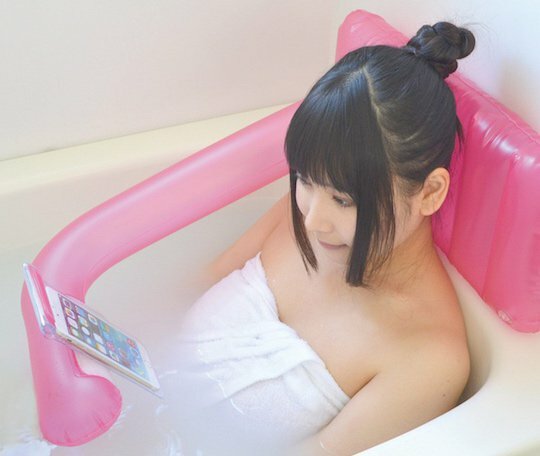 Protect your phone and get more comfortable in the tub with the Bath Air Pillow Smartphone Holder. This gizmo features an inflatable pillow with an attached, extendable arm that hooks over your shoulder. The arm holds a plastic waterproof sleeve for your phone. You can even access your screen while it’s inside the protective covering. These gadgets make perfect gifts because they’re useful for absolutely anyone. Surprise your friends and family and pop these handy tools into their stockings this year.